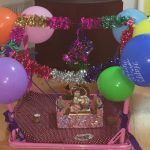 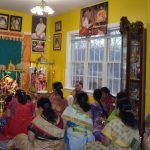 By the divine grace of Sri Swamiji and Madhuri Sakhi sametha Sri Premika Varadhan, Virginia GOD satsang celebrated year end satsang on Thursday, December 31st at Sri RamanJi and Smt LalithaJi ‘s house and offered their prayers and gratitude to the Lotus feet of Sri SwamiJi for blessing year 2015 with many satsangs and prayed for more kaikanrayam and satsang in year 2016. 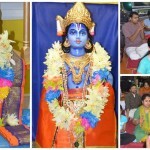 Satsang started with Mahamantra Nama Sankirtan, Guru Kirtans, Madhura Getham, Kadha Shravanam, Mangalam and Aarthi. 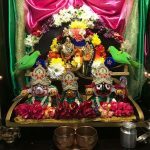 On Friday, January 1st Virginia GOD Satsang devotees did a Mahamantra Nama chanting at Richmond Temple and did a Nagara Sankirtan chanting Mahamantra. 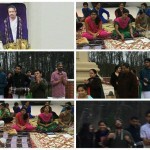 Around 30 fortunate devotees participated in this. 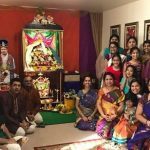 With the beginning of New Year 2016, devotees around the world from New Zealand to California chanted Mahamantra for 24 hours on Saturday, January 2nd 2016 for peace and harmony in the world, this country, city, community and within our own selves. 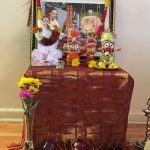 Virginia GOD satsang chanted Akanda Mahamantra from 6 am-6 pm at Sri Murali and Smt Malathi’s residence. 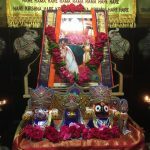 Around 25 devotees participated and chanted nama on this unique occasion.